Not every set of DC Minimates includes one hero and one villain. Sometimes characters are just more identifiably paired with someone from their own good/evil alignment. Joker and Harley Quinn, for instance, or super buddies Blue Beetle and Booster Gold. A student of Dan Garrett, the original Blue Beetle, Ted Kord inherited his mentor's name, but not his powers. Using his scientific knowledge and family fortune, Ted developed an arsenal of weapons to allow him to fight crime. Originally little more than an oddity or a joke, his determination and will eventually led to him being invited to join the Jusice League. 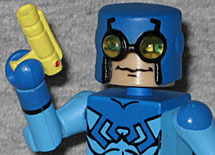 Blue Beetle only really wore one costume in his career, so it's not like there was some debate about which look this Minimate would sport. It's actually a really nice design, one that's held up well over the years. The body of the suit is a light blue, while the gloves, trunks and boots are darker. A dark blue bug design falls over his chest and shoulders, giving him a pleasantly unique look. 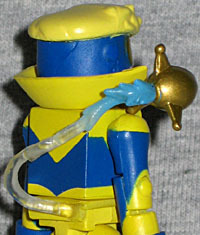 The figure's cowl is removable, and has translucent yellow goggles. The face beneath is plain, but that's fine - Ted is an unremarkable guy. The mask goes on and off easily, but don't push it all the way down; it's not designed to line up if it's squashed down on his head. He also comes with his tiny yellow "BB gun," a non-lethal weapon which shot compressed air and a flash of light to confuse enemies. It fits in a holster on his hip, which is actually part of a "belt" that fits between his torso and hip blocks. It was in the Justice League that Blue Beetle met his best friend, Booster Gold. A time-traveler from the future, Booster uses the technology that's mundane in his time to be a hero in ours. Yay him! Now, Booster's already had two action figures - one from Mattel and one from DC Direct - but this Minimate beats them both when it comes to cuteness and portability. Booster Gold actually has worn several costumes over the years, including a big suit of armor designed by Mike Wieringo. This is the classic look, however, a yellow and blue suit with a big ridiculous disco collar. The blue sections have nice, straight edges, with absolutely no spillage. 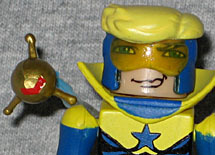 His collar is a separate piece, as is his blonde hair, blue cowl and transparent orange goggles. His blue wrist bands are pieces held in place by his hands, and they even painted a small circle on his right hand to represent his pilfered Legion flight ring. When Booster came back in time, he didn't come alone - he brought a little floating computer with him, packed with information that would help his heroic career. This security droid, named "Skeets," has sort of come and gone over the years, but it's cool that the Minimate has him. Much like the Yellowjacket that came with Wonder Man, Skeets attaches via a clear strand of plastic to Booster Gold's belt. Or, well, to the thin plastic tab that fits between the two halves of the figure. 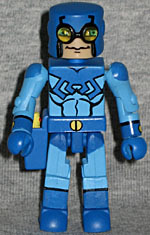 All Minimates are built on the same basic body - a blocky, 2" body that manages to pack in 14 points of articulation. The Minimates have evolved a bit over the years, and the DC Minimates have all the modern tricks: Lego-sized holes in the feet, "< >" shaped bits inside the torso, a bigger range of motion in the shoulders and a peg in the hair pieces that plug into the figures' heads. All that means quality construction and good playability, and that's what you want. Both halves of the Blue and Gold team have recently regained some prominence in the DC Universe - and both of them by dying. The fanboys got up in arms because the characters were suddenly something more than the jokes they'd been for two decades, and actually went out with some dignity instead of with their pants around their ankles and a pie in the face. Oh no, characters treated differently than you remember them when you were eight? The nerd world is coming to an end! Whether you liked Blue & Gold when they were characters or when they were punchlines, these Minimates are a great pair.